is an incredibly difficult thing to do. 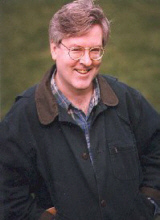 G. Wayne Miller, an award-winning journalist for The Providence Journal and bestselling author, does it superbly. For Toy Wars (Random House), Miller spent five years inside the corporate world of Hasbro: where toys are a deadly serious business and the competition is cutthroat. In King of Hearts (Random House), Miller detailed the fascinating life of the eccentric heart surgery pioneer, Dr. Walt Lillehei. Now, in his latest book, Men and Speed (PublicAffairs), Miller goes behind the scenes of a NASCAR powerhouse: Roush Racing. The legendary Jack Roush gave Wayne unfettered access to Team Roush for the 2001 Winston Cup Season: an amazing year which saw the death of Dale Earnhardt, the dashed hopes for a championship season for Team Roush (Mark Martin, Jeff Burton, Matt Kenseth and Kyle Bush) and major controversies about the safety of stock car racing. Wayne Miller's books have received great critical acclaim; his powers of observation and storytelling skills are every bit as good as Tom Wolfe's. But his greatest skill is his ability to take a true story and make it as exciting as a well-written thriller, while still maintaining scrupulous accuracy. The New York Times said of Toy Wars, "An absorbing, lively chronicle of a family-owned company and its inanimate offspring... entertaining and informative... engagingly written." Forbes magazine described King of Hearts as, "Exhaustively researched, novel-like... The resulting tale grips like a surgical clamp and doesn't let go." In our last interview, Wayne spoke with us about Toy Wars, and how he got his start as a reporter and author. In this exclusive new interview, Wayne discusses the people who helped inspire him in his writing, his time inside the world of Winston Cup racing, the effect that Dale Earnhardt's death had on the sport, and how he himself felt the "need for speed" by the end of his stay. Anything I could get my hands on, even the dictionary (OK, not the Baltimore Catechism). I loved encyclopedias -- one of the treasures of my youth was the Golden Book Encyclopedia, which my mother purchased, one 99-cent volume at a time, at the local A&P. It's still up in the attic of her house, next to the model cars and ships I built as a boy. My fiction passion in grammar school was The Hardy Boys, which later spilled over to the Doc Savage series. I occasionally snuck reads of my older sisters' Nancy Drew. Edgar Allan Poe was high on my list starting at about seventh or eighth grade. Then, of course, I discovered the other great writers in high school. And because my parents were newspaper junkies, I was reading the local daily and The Boston Globe early on. We were allowed little TV, which, in retrospect, was a very good thing. All three of our children are great readers today, in part because we have limited their TV. Is there anyone in your life that you credit with giving you the inspiration to become a professional writer? My parents -- my mother especially -- were very supportive of my reading and writing. But in terms of the classic mentor, I didn't have one until after I landed my first job at a small newspaper. I got into professional writing because at an impressionable age it struck me as cool that I could actually earn a living at something I loved to do. Having said that, my freshman English teacher was the one who stood above all others in heading me down the writing road. He encouraged creativity and independent thinking, and opened my eyes to the possibilities -- and it was in the school paper, which he oversaw, that my first published piece appeared. Let's talk about your latest book, Men and Speed. How did this book project come about? It grew out of a brainstorming lunch I had in the fall of 1999 with my longtime editor at Random House, Jon Karp. King of Hearts was soon to be released, and while we thought it was a pretty good book from a literary perspective, we questioned its commercial prospects. And so, to be crass, one of the objectives of our brainstorming was to find a topic that would permit not only a literary approach but also have a good chance of selling with some intensity. I had come up with a list of 20 or so topics, and Jon went through it, stopping on NASCAR. This is it! he said. To our knowledge, few, if any, writers from outside the motorsports press corps had written the type of book we began to develop that day over lunch. Jon later left Random House (he has since returned) and I went to another publisher, the esteemed PublicAffairs. Meanwhile, I plunged into NASCAR, about which I knew precious little. I recognized a few names (Richard Petty, Dale Earnhardt) and I knew the sport had become wildly popular, a full-blown national cultural phenomenon, but I would have been hard-pressed to tell you what a qualifying lap was. And I certainly had never heard of Jack Roush or Kurt Busch. How did you manage to get such wide-ranging access to the race world? Wasn't Jack Roush nervous about having you around all the time? Matt Kenseth's crew about to pit the No. 17, at the NAPA 500.
this sort of thing with other topics before, I just parachuted in. I read a lot about NASCAR, visited websites, and soon enough identified a driver who had a law degree -- Jon Karp had suggested that it would be interesting to see if anyone in NASCAR was intellectually accomplished, and could thus possibly help explain the sport on a more sophisticated level. The driver was receptive to my approach, largely because I was an established author and could point to a body of work and say: judge for yourself. That driver had a teammate, and I approached him, too, and soon after that, made contact with executives at Roush Racing. Having gotten a green light all the way, I finally established contact with the top dog, Jack Roush. Freely distributing copies of my previous books helped open the door with everyone, as did my habit of patiently explaining my objectives in letters and calls. I am a very upfront writer, but not pushy or assumptive. Anytime I seek to take up residence in someone else's world, I understand it is their world, not mine, and I should behave as any polite visitor would. You get more flies with honey than vinegar, to quote my dear mom. But there is always an element of good fortune and sheer luck in these deals, and I was once again blessed. I could have wound up with a wonderfully receptive but second-rate team, not the largest in all of NASCAR. There are times when you offer up praise to the gods of writing, and this is one of them. As for Jack, he understood immediately what my involvement would mean because I explained it in detail. He allowed me because he was proud of what he does and at that point in his life -- nearing 60 -- he felt he had a story worth telling. He is a naturally curious guy, and I think the prospect of watching a writer at work intrigued him -- to an extent, he vicariously immersed himself in my craft much as I did in his. And he's a no-b.s. guy, who has lived with risk and death for so long that very little makes him nervous, certainly not a guy with a tape recorder, notebook and pen. The worst that could happen, he probably assumed, was that I would get it wrong. But I established trust from the start; again, having published five books spoke to my legitimacy. So did the c.v. I sent people, and my personal website, www.gwaynemiller.com, to which they were referred if they wanted to sicken themselves with detail! What surprised you most about your investigation? 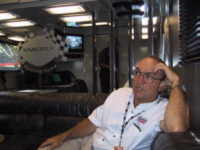 Jack Roush relaxes inside Mark Martin's hauler. To be blunt, that so many in NASCAR are so intelligent. I don't mean that they are college-educated (with his master's degree in mathematics, Jack is a freak in that world) -- I mean just in how their brains work. I guess I expected stereotypical racecar drivers -- compelling, to be sure, but rather slow on the uptake. I soon learned this was not true. Racing has grown too complicated at the Winston Cup level for dummies to prevail. And there is a certain base level of smarts needed to keep from getting killed (or killing others) when you're directing 800 horsepower at 205 miles per hour, even if it is around and around in circles. And the very best drivers are extremely knowledgeable in chassis, engines, every aspect of a purebred racing machine. Another big surprise was how thrilling racing is in-person. TV just doesn't do it justice. Also, I was surprised to find that beneath the surface of loud circular motion lies a very complicated strategic game. Car racing makes many demands on its drivers: the grueling scheduling of the Winston Cup season, the danger, having to handle the media etc. And very few drivers actually win races. Describe the ideal temperament for a successful race car driver. "The story of the men in Men and Speed is compelling, for they are truly a breed apart, and my two years with them was exciting -- two years I wouldn't trade for the world." He or she is patient, hard-working, competitive, extraordinarily ambitious, and has an almost insane capacity for enduring heartache and disappointment. He or she also craves -- and I use that word deliberately -- the thrill of winning at speed. Night and day, these drivers are obsessed with getting to Victory Lane. And some go years without ever getting there, which speaks to the intensity of their addiction. Are race car drivers athletes? What's your opinion on this controversy? 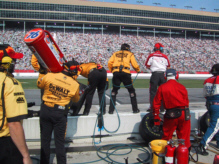 I agree with Jeff Burton, who notes that drivers in general do not share all of the skills of a Michael Jordan or a Barry Bonds -- but nonetheless they must be strong, must have unusually quick reflexes and hand-eye coordination, and must be able to concentrate under extreme conditions of heat, noise and motion for hours and hours. So while not athletes in the classic, pure sense, racecar drivers are hybrids -- athletes of a special kind. I would liken them to sailors or equestrians, even bobsledders, all of whom compete at the Olympic level and are generally considered athletes. Would you take us through a typical day for a racer? 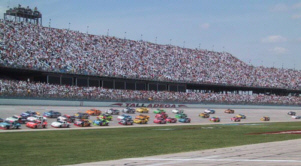 The start of the Talladega 500, April 22, 2001. How about a typical week for a top Winston Cup racer: Monday through Thursday is devoted to work at the shop, sponsor appearances and media commitments, and, often, testing -- going to an empty track to try out a new car or a new set of tires. Thursday night is spent traveling to the next competition, and Friday is spent at the track practicing, qualifying (time-trial laps that determine the starting order of a race), and fine-tuning the car. Saturday brings more practice and more fine-tuning, and often autograph sessions and more interviews. The driver and his family, meanwhile, during their down moments are all but imprisoned in their motor coach, which serves as a home away from home on race weekends. Motor coaches are parked at the speedway, and drivers rarely venture out, for they can't get three feet without being mobbed. On race day, usually a Sunday, the driver has breakfast with his family and leaves the motor coach for the garage area, where the cars are serviced and tuned. After checking on his crew, he then visits a sponsor's hospitality tent to greet employees and friends of the sponsor -- drug giant Pfizer, for example, primary sponsor of Mark Martin's No. 6 Viagra car. Then it's back to the garage area and into the team trailer (aka hauler) for some last-minute race discussions and a bite to eat. All drivers must attend a drivers' meeting about an hour before race time, and that meeting is followed by chapel service. Accompanied by family and other significant others, the driver heads to the start/finish line for introductions and a wave to the crowd. Finally, he buckles himself into his car and powers up! A winning driver stays at the track for interviews and appearances that can last into the night, but the rest high-tail it home -- often by helicopter from the speedway to a nearby jet. Then the week starts all over again. And only three weekends off in a season that lasts from before Valentine's Day to Thanksgiving. 2001 was supposed to be the year for Team Roush, yet not far into the season, it became clear that the season was going to be filled with disappointment. Do you think Jack Roush regretted having allowed an investigative reporter to witness such a painful time for his team? 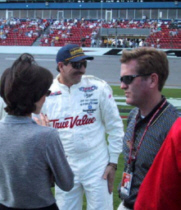 Dale Earnhardt with Jeff and Kim Burton at Daytona, February 2001. Jack would certainly have rathered a winning season, but he was a man of his word and he knew starting off that I was in it for the long haul -- win, lose, or draw. So I'm not sure he regretted his decision so much as lamented it, or wished that fortune had smiled on him. He also knew the epilogue would be the start of the 2002 season, so he had one more chance to show his teams' stuff (it paid off!). And with their strong start (and, now, with the April 19 plane crash that nearly killed Jack on his 60th birthday), an updated second edition is all but a certainty. Dale Earnhardt's death was a real shock to racing fans, and it seemed to ignite the controversy about safety in the sport. Does NASCAR bear some responsibility for the crash because of the new aerodynamic rules which allowed more frequent lead changes and bumper-to-bumper racing (which is more exciting to watch on TV)? What changes have come about because of his death? While the aerodynamic rules contributed to many wrecks at the superspeedways (and still contribute, note the big wreck April 21, 2002 at Talladega), they were actually not a major factor in Earnhardt's crash. But in my view, and the view of many others in and out of the sport, NASCAR must bear some responsibility for several recent deaths of drivers, including Earnhardt, in this regard: they took far too long to mandate life-saving head and neck restraint devices (one model of which is the so-called HANS device). One of the subplots of Men and Speed is NASCAR's slow but eventually laudatory effort to improve driver safety. Changes include mandating the head restraints, black boxes on cars to record crash data, a medical director at races, and more. One thing that surprised me was finding out that NASCAR is really owned and controlled basically by one man and his family. I guess I assumed it was a governing body made up of the owners, as in other professional sports. Is there resentment in the industry over the power and secrecy wielded by Bill France, Jr. and NASCAR? I was just as surprised as you, having held the same assumptions. There indeed is some resentment over France's power, which is all but absolute -- and that power, and the secrecy with which he yields some of it, is constantly criticized. On the other hand, a lot of people have been able to live their passion to the fullest (not to mention become wealthy men and women) because of the France formula. So while the voices of opposition are there, they hardly constitute a roar. Given the dangerous nature of car racing, it seems that there would be some federal regulation, as there is in boxing. Do you see increasing regulation in the future for car racing? "[A]utomobile racing remains one of the last bastions of male chauvinism. There are exceptions, but in general, a nearly all-male world does not open its arms to women. Which is a shame." I don't, given NASCAR's recent changes on safety matters -- and also given that there is no groundswell of support with a Republican president and House to get the federal fingers into the pie. However, that could change: a major lawsuit, for example, on behalf of a dead driver could be an impetus. But in the present climate, with the sport so popular and the top participants so relatively satisfied, I foresee nothing but status quo. Why are there so few women in racing? What special challenges do they face? Two main factors: despite the advances women have made in our culture in the past quarter century, few parents (for a multitude of reasons) steer their young daughters into go-carting, quarter midgets, or the other forms of kids' racing. And if you look at the top drivers, all, virtually without exception, got started in racing by the time they were seven or eight. The other reason is that automobile racing remains one of the last bastions of male chauvinism. There are exceptions, but in general, a nearly all-male world does not open its arms to women. Which is a shame. Did you feel the addiction, the thrill of speed yourself at any time? What was it like for you? Is your family scared to get into a car with you now? I'd like to talk a bit about the practical side of your profession. A project such as this must involve a massive amount of interviews, research and note taking. How do you keep it all organized? How did you arrange your work schedule? It did involve all of that. A laptop was invaluable, and I used it everywhere: speedway media centers, hotels rooms, airplanes and airports, even waiting in my car in the heavy post-race traffic. Transcribing tapes and organizing notes immediately and religiously helped. During the season I chronicled, 2001, I worked virtually every weekend and of course most weekdays. It was a crazy, crazy work schedule, necessitated by the deadline: I had to turn in the complete manuscript in early January, after having sent chapters as I went along. I have never written on such tight deadlines (and hope never to have to again). Last year exhausted me. Our last interview was in 1998, when the Internet was just making itself felt in the newsroom. Since then, we've had the dot com crash, a recession and the war on terrorism. How have these events affected the newspaper industry, in terms of either security issues and/or economics? This is a topic on which we could go on endlessly. I promise I won't. The recent recession, to which the dot com crash is related, hurt newspaper advertising revenues, which in turn affected staffing and quality. At many papers, positions went unfilled, journalists were laid off or fired or bought out, and the industry all but completed its transition from family ownership to out-of-town, corporate ownership. All of this has affected the quality of journalism, at many, many places. It's a shame. I hate it. Conversely, the war on terrorism stoked the appetite for news -- and circulation at many papers has stabilized or even increased, and hits to many newspaper websites have shot up. This is good. One of the best bargains around remains a newspaper website. Most are excellent, and some are truly great. Where were you on September 11, 2001? What thoughts went through your head then? How did you discuss the attack with your children? I was at home, working on Men and Speed and planning for the next weekend, when the Cup circuit was supposed to move to New Hampshire. When I went online to check my email, I found an AP bulletin on The Providence Journal website (http://www.projo.com) and ran immediately to the TV, where the first images of the first tower being hit were airing on The Today Show. I was horrified, saddened, and scared -- like many, especially as the morning unfolded, I was waiting for the other shoe to drop. And it did. Perhaps because I have a morbid imagination, I began to think of bioterrorism being the next shoe to drop. I thought that life would never be the same in America. At some point, anger crept in. I realized that the book would have to be put on hold, and I came into The Providence Journal to join the reporting effort. God, it's painful remembering that day. Children -- well, I told Cal, our 8-year-old, that bad people had done a bad thing in New York. He had just been to the city the month before with me, a friend, and Alexis -- and he had been before that, so he knew about the World Trade Center. But we shielded him from the TV images. Rachel and Katy, 20 and 16 respectively, were different, of course. I could not calm their fears that day -- who knew what would come next. But I did assure them that ultimately those responsible would be found, and no matter how bad things got, eventually the U.S. would prevail and justice would be served. But we all cried, I must tell you. We knew none of the direct victims, thank God, and yet we felt such deep sorrow for all those who died and their families and friends. All a very typical reaction, you see. Tell us about The Cambridge Company. It's our small writing and editing company. We have done some select projects, and will continue to, but Men and Speed has consumed most of my time for the last year so we have not marketed ourselves aggressively. As suitable work comes our way, we take it on. 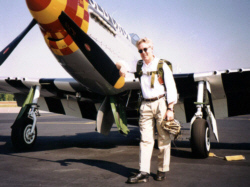 Wayne Miller about to ride in Jack Roush's P-51 Mustang (photo by Jack Roush). How would you feel if your son were to inform you that he wants to be a Winston Cup driver? I would strongly discourage him. The story of the men in Men and Speed is compelling, for they are truly a breed apart, and my two years with them was exciting -- two years I wouldn't trade for the world. But the sport is just too dangerous to want to risk my only son -- or my daughters, for that matter. There will be no Miller racing dynasty, if I have any say in the matter. All racing photos Copyright © G. Wayne Miller 2002, unless otherwise indicated.